ANAHEIM, Calif., Feb. 14, 2018 /PRNewswire/ -- The Amtrak® Pacific Surfliner® has partnered with the Disneyland® Resort to offer special, limited-time savings for Southern California Residents on train travel and Disneyland® Resort theme park admission through May 21, 2018. The Pacific Surfliner brings nearly 3 million travelers annually to Southern California destinations including Anaheim, the gateway to the Happiest Place on Earth. "We are excited to partner with the Disneyland® Resort to offer enhanced savings not only on train travel, but on a quintessential SoCal experience," said Bryan MacDonald, chairman of the Los Angeles – San Diego – San Luis Obispo Rail Corridor Agency, which oversees the Pacific Surfliner service. "Through this partnership, we hope to make passenger rail service more accessible and approachable for Southern Californians, while also providing added value to our existing Pacific Surfliner customers." Anaheim Resort Transportation (ART) provides a connection from the train station to the Disneyland® Resort. The ride is free with a valid train ticket. Participants can travel to Anaheim by train from points throughout Southern California, including San Diego, Orange County, Los Angeles, Ventura, Santa Barbara and San Luis Obispo. Kids Ride Free to Anaheim – Book the train to Anaheim, CA and for each adult ticket purchased, receive one child ticket free (ages 2-12). To redeem, select one "Adult" and one "Child" as passenger types, and enter promo code V231. 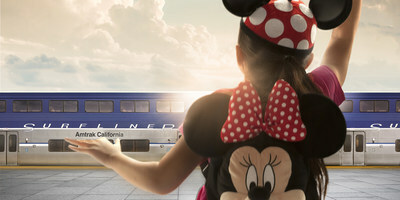 Visit pacificsurfliner.com/Disney for complete details. The Amtrak Pacific Surfliner travels along a 351-mile coastal rail route through San Diego, Orange, Los Angeles, Ventura, Santa Barbara and San Luis Obispo counties. To learn more, visit http://www.pacificsurfliner.com/. The Los Angeles – San Diego – San Luis Obispo (LOSSAN) Rail Corridor Agency manages the Pacific Surfliner service in close coordination with its member agencies, Amtrak and Caltrans.